Every weekday, I drive my daughter to preschool. It’s a nice routine, one that gives me a chance to spend some time with her. I make breakfast for her, make sure she’s adequately dressed for the weather, brush her beautiful long hair, and then we’re off to her preschool. Along the path from home to preschool is a gas station. That station has the lowest gas prices within about a ten mile radius, so it’s the one I tend to use regularly. Right next to the gas station is a free air pump, which I use about once a month or so. After I fill up, I drive over to the air pump, pull out my air gauge, check the pressure in each tire, and fill it up to the maximum recommended pressure as suggested in my car’s manual (see – there’s that car manual mentioned again). Quite often, I’ll stop there before dropping off my daughter. She’ll get out of the vehicle with me, talk to me while I’m airing up the tires (she doesn’t quite have the finger strength to actually air them up, though we’ve tried), and often she’ll help me pull the air tube around to the proper position so that I can air up each tire. It’s a bit of father-daughter bonding, sure, but it’s also saving me some money and subtly teaching her about a really valuable tip for auto maintenance. I actually learned about this tip the hard way, too. I used to just get my oil changed at a full-service oil change place that would air up your tires for you each time. I always felt that was good enough. In 2006, though, I started getting really into measuring my vehicle’s fuel economy and figuring out ways to reduce it. I got my oil changed on a very hot day late in that summer, and by early December I was due for another oil change. This caused me to spend most of an hour getting the spare tire on, which meant I was a bit late for work. That evening, when I stopped by the oil change place, they noted that the spare tire was on the vehicle. They noted that the air pressure on all of my tires was almost dangerously low. They also looked at the other tire that was sitting in the back and told me that it was fine and that likely it had been pushed off by bumping into a curb or something. 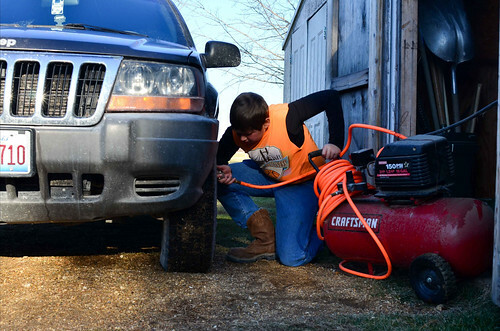 That’s one way that airing up your tires can save you money and time, but that’s just one. The biggest reason to do it is that adequately aired tires save on your gas mileage. It’s pretty clear-cut, actually. Every psi that any one of your tires is below the recommended maximum costs you 1/8% of your fuel efficiency. So, if all of your tires are 4 psi below the recommended maximum, your fuel efficiency goes down 2%. If they’re 6 below, you lose 3%. Let’s say your tires are running 6 psi below the maximum. That’s a 3% reduction in your fuel efficiency. Your 25 mpg car goes down to 24.25. Over just 1,000 miles, that means your car is using 1.2 gallons more in fuel than if you had maximized your tires’ air pressure. That’s $4 gone, right there. If it takes you 5 minutes to air up your tires, that simple move is saving you money at a rate of $48 per hour of effort. That’s well worth it. All you need is to keep a tire gauge in your glove compartment and know what the maximum PSI is for your automobile (it’s in your manual). Fill your tires up with air once every month or two – it’ll just take you five minutes. Doing so will keep your tires at the maximum recommended pressure, maximize your fuel efficiency, and keep your tires on the rims (although that only happens if you neglect it for too long).